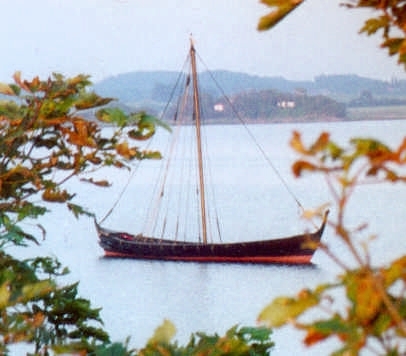 The ship Lindheims Sunds got a fair amount of attention in the summer of 2003, when many newspapers announced that a Viking Ship was wrecked in the sea around Southern Funen. The wreckage turned out to be not quite as dramatic as one might asume. Members of the crew got wet, but all safety routines worked perfectly, and no-one got hurt. The ship was succesfully brought to the shore without suffering damage. In fact, the ship is unusually well kept. In 1992 a new rigging was fashioned according to latest knowledge. Lindheim Sunds was thoroughly renovated in 1994/95. 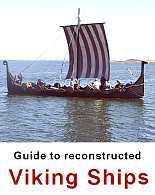 The ship was constructed as an integral part of an exam project by students at the Free College of Education at Ollerup. More than 11.000 hours were spent over more than a year on building a ship that was as close to the original Skuldelev V as possible. The main body of work was performed using axes and other original tools. It was a learning process, and therefor not everything ended up being entirely like the original. A small number of compromises was made, i.e. iron rivets were used in some places. Originally, the ship was given a sail of manmade fibres, and the ropes were nylon. In the course of later renovations, the nylon ropes were replaced by a mixture of hemp and horse hair. The ship, incidentally, has produced impressive results in experiments combining rowing with beating up against the wind, achieving a speed of 7-8 knots. Apart from Lindheim Sunds, the Skibslag 5 also disposes of the Norwegian fjordboat Vid, which is mainly used for training. Maximum persons: .approved for 30 persons, incl crew. Boat Guild: Tthe guild, Skibslag 5, has some 120 members, mainly students from Ollerup, but it is open to anyone. Terms of hiring: The ship can be hired, but primarily to school classes. If free, however, others may hire it.